This is setup options for HTTP upload send method (wsmHTTP). They are located at Sending tab. Note: HTTP upload can be used as received for bug tracker. See example for FogBugz. 2. 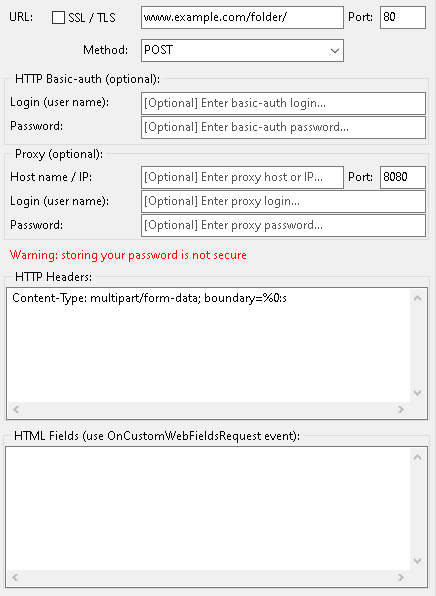 "Port" (.SendHTTPPort) option specifies HTTP port on web server. It's 80 by default. Other common value is 8080. For SSL/TLS it's usually 443. 3. "SSL / TLS" (.SendHTTPSSL) option enabled secure mode (HTTPS protocol). Don't forget to adjust port number, if you change this checkbox. 4. "BasicAuth" (.SendHTTPAuthLogin, .SendHTTPAuthPassword) options specify account details for Basic-Auth type authentication. Usually these fields are blank. Fill them, if you use Basic-Auth on your web server. 5. "Proxy" (.SendHTTPProxyHost, .SendHTTPProxyPort, .SendHTTPProxyLogin, .SendHTTPProxyPassword) options specify proxy details. You can leave them blank to use system-provided settings. Or you can fill these values to set custom proxy.